The Routledge Handbook of Forensic Linguistics provides a unique work of reference to the leading ideas, debates, topics, approaches and methodologies in Forensic Linguistics. Forensic Linguistics is the study of language and the law, covering topics from legal language and courtroom discourse to plagiarism. It looks at the linguist as expert providing evidence for the defence and prosecution, investigating areas from blackmail to trademarks and warning labels. 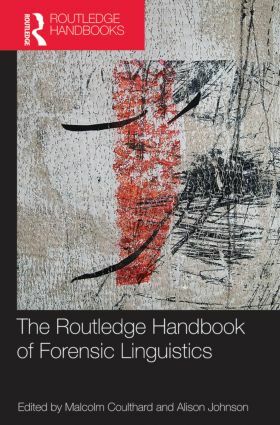 The Routledge Handbook of Forensic Linguistics includes a comprehensive introduction to the field written by the editors and a collection of thirty-seven original chapters written by the world’s leading academics and professionals, both established and up-and-coming, designed to equip a new generation of students and researchers to carry out forensic linguistic research and analysis. The Routledge Handbook of Forensic Linguistics is the ideal resource for undergraduates or postgraduates new to the area. Malcolm Coulthard is Professor of Forensic Linguistics at Aston University, UK. Author of numerous publications, the most recent being An Introduction to Forensic Linguistics (co-authored with Alison Johnson, Routledge, 2007). Alison Johnson is Lecturer in Modern English Language at Leeds University, UK. Previous publications include An Introduction to Forensic Linguistics (co-authored with Malcolm Coulthard, Routledge, 2007). Contributors: Janet Ainsworth, Michelle Aldridge, Dawn Archer, Kelly Benneworth, Vijay Bhatia, Ronald R. Butters, Deborah Cao, Malcolm Coulthard, Paul Drew and Traci Walker, Bethany Dumas, Diana Eades, Susan Ehrlich, Fiona English, Tim Grant, Peter Gray, Gillian Grebler, Mel Greenlee, Sandra Beatriz Hale, Chris Heffer, Elizabeth Holt and Alison Johnson, Kate Howarth, Michael Jessen, Krzystof Kredens and Ruth Morris, Greg Matoesian, Gerald McMenamin, Frances Rock, Laura Felton Rosulek, Nancy Schweda-Nicholson, Roger Shuy, Lawrence Solan, Elizabeth Stokoe and Derek Edwards, Peter Tiersma, Tatiana Tkaèuková, David Walsh and Ray Bull, David Woolls, and Jerome Bruner. Text messaging forensics Txt 4n6: Idiolect free authorship analysis?